Condensing my conversations with Maria Bossman Damiba into a profile feels a little like pouring the ocean into a teacup. We are separated by two countries and cultures that are seemingly always at odds over who has the best rice, but technology connects us with a simple instant message sent via Twitter. 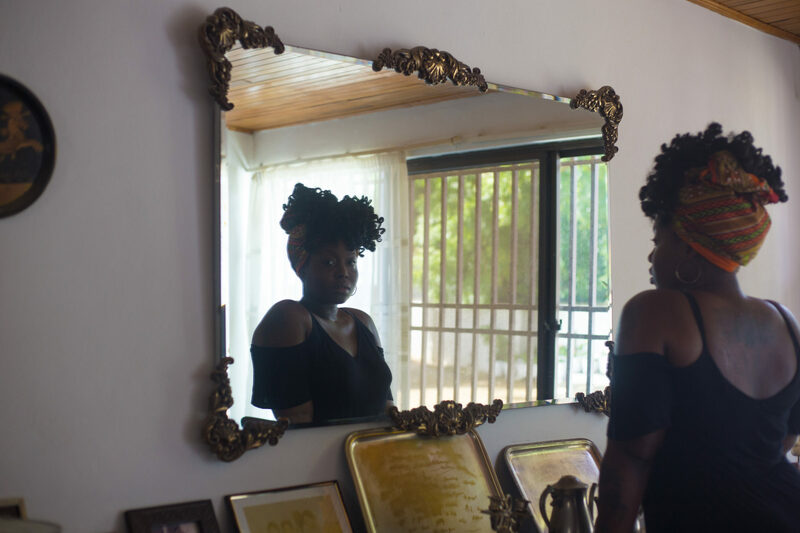 Ria was delighted to find out we considered her part of our “Trybe”, a curated list of artists challenging everything we’ve come to expect of millennial music from Africa, and gave a rare look into her psyche. But I wasn’t coming into this assignment blind. I’d already met Maria, just not as Ria Boss, the smoky voiced, confessional poet who had just put out her first EP. I knew of her as Hajia Kitty, a decadent, slippery tongued rapper who wore her sexuality like a day suit and had only mysteriously appeared as a guest artist on Fu’s Make War cover, and part of the Kuvie’s all-star line-up on “Dumb”. After mobile network failures and scheduling constraints resorted us to speaking via exchanged voice-notes, I wondered who exactly I would be hearing from: Maria, Kitty or Ria. I heard all three women, like the Greek Fates, tell me about a life, much grander than anyone should have. Every great artist has those that inspire them, and Ria is no different in this respect, as she happily lists her idols. All the usual suspects make her list: Jill Scott, Teddy Pendergrass, D’Angelo, Erykah Badu, Nina Simone and Billie Holiday. But curiously there is also Nai Palm of Hiatus Kaiyote, Lianne La Havas, Frank Ocean and Florence Welch, innovation and tradition both equally represented. Then crucially, her grandmother, who was consumed with wanderlust and guided Ria through the often-forgotten aftermath of Soviet Europe, the newly technology-dominated heart of Asia, and Gabon, mere miles away from her estranged diplomat father. It only made sense that Ria would eventually seek to make her fortune in America, where most of her idols had gone to make theirs. Ria didn’t realise being a nomad meant you were always leaving parts of yourself behind, and by the time she entered the relationship that would eventually become the catalyst for her EP Find Your Free, she was a husk, running on empty. It would be an easy cop-out to say that her relationship was toxic and its toxicity infected her, but Ria Boss concedes that her significant other was just as much a victim of her malice as she was of his. His presence merely amplified the things that living out of a suitcase allowed her to outrun. That pause was killing her, and she did the only thing she could, she documented this decline over the course of five years, crafting the songs that would eventually become the album. But she had to leave one more time, to get away from him, and away from New York, a city which had become her home and the place where her music had gone from a hidden dream to her very existence to find the courage to truly find catharsis. 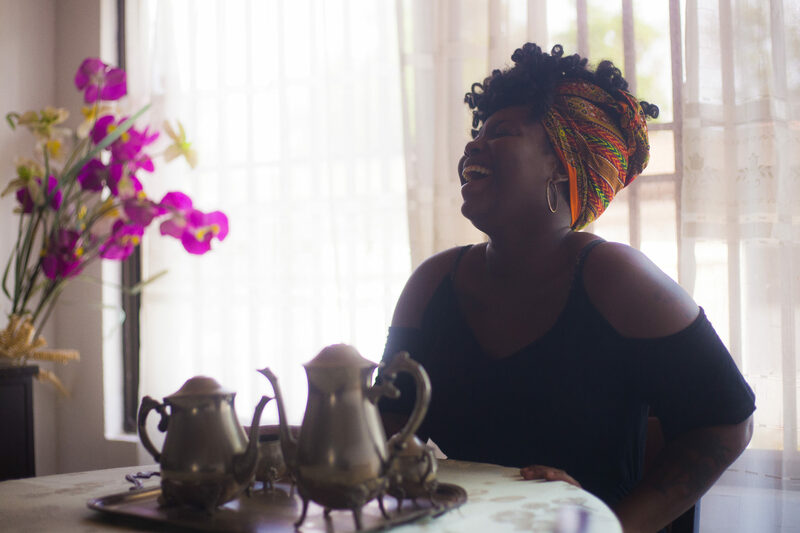 She left New York for L.A and once there, got down to the task of healing through the EP. “But Find Your Free is not a break-up album,” Ria Boss asserts, a lightness lilting her voice, “It’s not even a post break-up album.” Instead, she explains that Find Your Free is a kind of catharsis. She needed anthems pull herself out of the darkness that surrounded her, so she made some. She needed a way to make sense of the carnage left in the wake of the end of her time in New York, she crafted herself a bridge. Bridges and anthems require technique to build and Ria Boss understands this, so she’s feeling out her way to the other side of being an artist. She speaks fondly of her time ‘gigging’ in The States, mentioning a number of memorable shows including one at the Brooklyn Museum for Target, another at the Milkshow in Seattle and considers them as her apprenticeship to understanding herself as an artist and learning that people can be cruel and inappropriate, like the man who catcalled her when she was performing at Catch The Wave in NY and had to be escorted out of the concert. But these opportunities, exciting as they were, left her underwhelmed, a cog in someone else’s machine. Teaching herself to produce her own music and build her own stage sets is how Ria is ensuring that going forward, contact with her craft is a fully immersive experience. 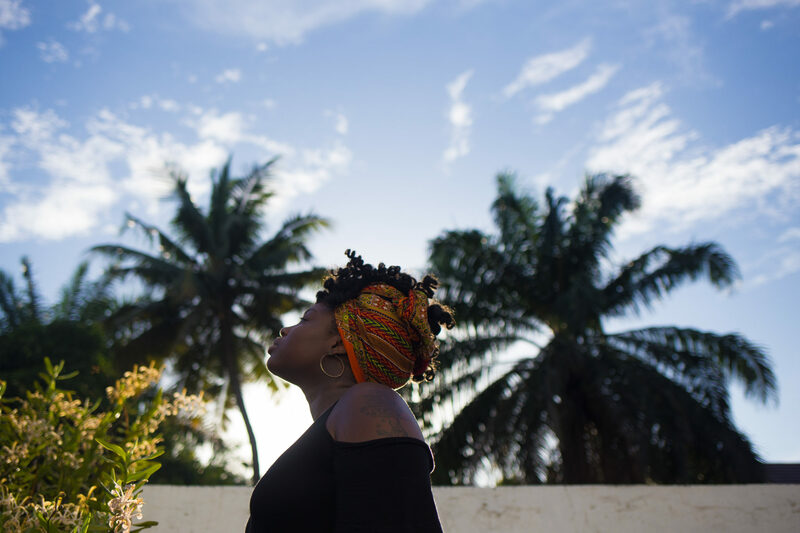 She got to test out all she’s learned so far at her latest performance in Accra at Serallio and liked it, almost as much as she likes the freedom of being able to make music when the inspiration hits. And this intrigues so much, I ask her to elaborate. Her debut EP can get very raw, so it is a relief to hear that the songs don’t necessarily reflect her life. They do however, reflect her moods, or sentiments that she’s held. Capturing a mood is hard, a sentiment even harder, so when fleeting epiphanies come, occasionally aided by a little green, she has to work quickly. Most of her music is done in a single take, while the ‘spirit’ is upon her, ‘riding her back’ to borrow from Voodoo imagery. But not all the masters recorded this way immediately become songs or singles. They stay in a vault that currently holds three hundred songs, in-limbo until Ria Boss finds them a home either as an independent project or a guest verse. Ria reminds me that the songs on Find Your Free did their time in the vault too. We wonder what the universe holds for them as they find their place in peoples’ hearts and minds. Which leads us to discussing what the universe holds for Maria herself. I put a spin on the kitschy question of the future, laying out a virtual tarot reading and letting her guide me through the cards. There are many things the cards say, Europe in the fall, festivals across continents introducing people to Find Your Free and the woman behind it. Maybe AfroPunk in Johannesburg this December. She definitely sees Hajia Kitty, her foxy alter-ego, inspired by the subversion of Missy Elliot and the brazen sexuality of Foxy Brown and Lil’ Kim, finally being formally introduced as an independent artist through an EP of her own. Ria Boss sees the vault being spring cleaned and songs making their own way into the world as a series of EP’s. So much to do in the next few years. Then Ria Boss hesitates, which is a strange thing to do when you’re recording a voice note, and her voice softens. It’s just Maria now, channelling herself and she is contagiously wistful as she takes a moment to contemplate. TRYBE is a collection of artists that are on the cusp of greatness.